Butler Vs. UConn – Coach’s Sports Bar Lancaster / Rosamond picks WINGS! THE BEST PLACE TO WATCH BASKETBALL and the best wings in the WORLD!!! 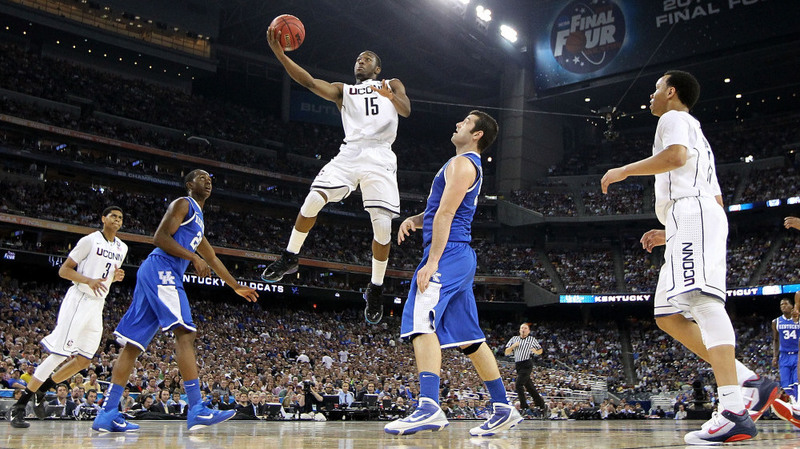 Kemba Walker of the Connecticut Huskies goes to the hoop Saturday past Josh Harrellson and Doron Lamb of the Kentucky Wildcats during the national semifinal game of the NCAA Men’s Basketball Championship in Houston. Connecticut beat Kentucky to advance to the championship game against Butler. One team is a longtime national powerhouse. One is an upstart that nonetheless played for a title a year ago. Now, at the end of a tournament filled with upsets and unexpected twists, these two teams — Connecticut and Butler — will face each other Monday night for the NCAA men’s national basketball championship. Butler’s 70-62 win over VCU and Connecticut’s 56-55 victory over Kentucky set up Monday’s intriguing final. Connecticut is a two-time national champion, while Butler returns to the title game for the second straight year, not as lovable underdogs but a team intent on making up for last year’s heartbreak. The Bulldogs were defeated by Duke last year for the championship. Shelvin Mack scored 24 points, Hahn scored all eight of his points during a 90-second span in the second half that gave Butler control of the game for good and the Bulldogs shut down hot-shooting VCU with their trademark unforgiving defense. The eighth-seeded Bulldogs (28-9) are the lowest-seeded team to play for the national title since Villanova won it as a No. 8 seed in 1985. “We’ve just got to be one shot better than last year,” coach Brad Stevens said. VCU (28-12) sure didn’t look like a team critics dismissed as “unworthy” — and a whole lot worse — after it skidded into the NCAA tournament with five losses in its last eight games. But Butler’s stifling defense was too much for the Rams, only the third No. 11 seed to reach the Final Four. But not enough of them. Jamie Skeen scored 27 and Bradford Burgess had 15, including three 3-pointers before the game was even seven minutes old. But Stevens is known for his tactical acumen, and this game was no different. He tweaked Butler’s defense, and Burgess had just one more three the rest of the night. Butler also dominated the boards, outrebounding VCU 48-32. Butler’s run last year inspired mid-majors everywhere, including VCU. The Rams had won a grand total of five games in the NCAA tournament before this year, never more than one at a time. Kemba Walker scored 18 points Saturday night to help Connecticut keep its remarkable postseason run going with a 56-55 victory over Kentucky that placed the Huskies one win away from their third, and most improbable, NCAA title. Walker also had seven assists, as UConn (31-9) won its 10th game in a row — a string that began with a five-win-in-five-night leg-drainer at the Big East tournament and now includes five straight in the tournament that really matters. The Huskies haven’t lost since they fell to Notre Dame on Feb. 5 and finish their Big East regular season at 9-9. They locked up this game with good defense and a remarkable cold spell by fourth-seeded Kentucky (29-9), which went 5:39 down the stretch without a point. That turned a 48-48 tie into a 54-48 UConn lead and the Huskies barely hung on. Brandon Knight led Kentucky with 17 points, but they came on 6-of-23 shooting. DeAndre Liggins hit a 3-pointer with 1:37 left to get the Wildcats within 54-51. Connecticut was last in the Final Four in 2009, the only time in coach Jim Calhoun’s three previous appearances the Huskies didn’t win the national championship. “We’ve got a heck of a challenge on Monday night, but the fact that we’re playing Monday night, that’s beautiful,” Calhoun said.